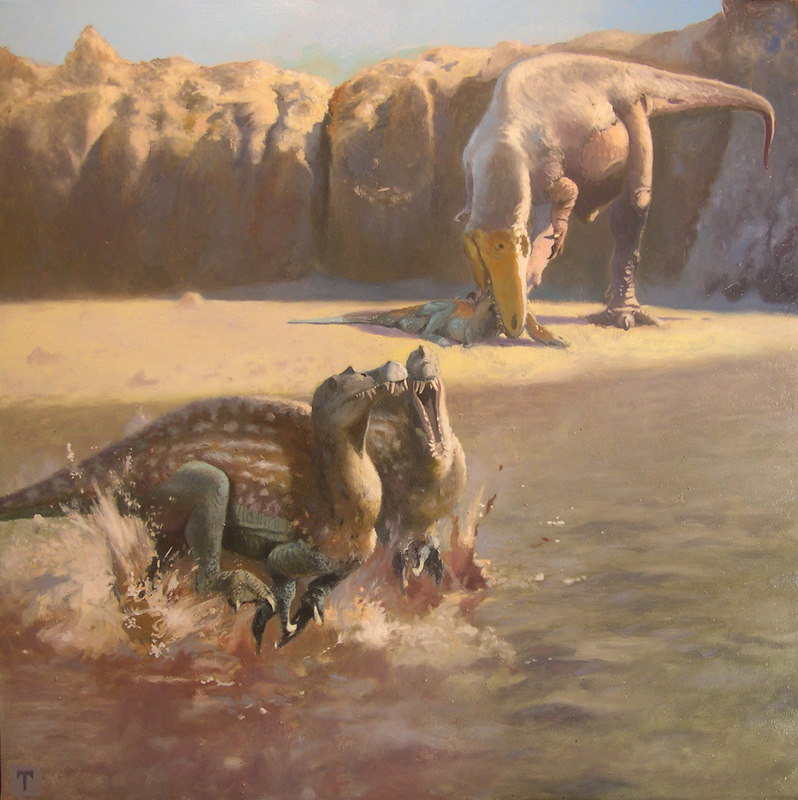 Sauroniops feeds on a young Spinosaurus while other Spinosaurus run nearby. In this study, we erect Sauroniops pachytholus gen. et sp. nov., a large-bodied theropod dinosaur from the Cenomanian (Upper Cretaceous) of Morocco, on the basis of an almost complete frontal showing a unique combination of features including a naso–frontal suture extended along 40% of the frontal length, a thick dome in the anterolateral corner of the dorsal surface, a trapezoidal prefrontal facet that is restricted to the anterodorsal margin of the lateral surface of the frontal with no participation in the orbital roof and separated from the lacrimal facet by a narrow vertical lamina, a hypertrophied ‘D-shaped’ lacrimal facet that is four times the anterior depth of the postorbital facet, and a raised posteromedial margin of the dorsal surface describing a saddle with the anterolateral dome and confluent with a series of anteromedial rugosities. Phylogenetic analysis found robust support for placing Sauroniops among the basal carcharodontosaurids and related to Eocarcharia, showed that some of the unusual features of the new theropod were convergently acquired by abelisaurids, and revealed a mosaic pattern in the evolution of the carcharodontosaurid skull table. 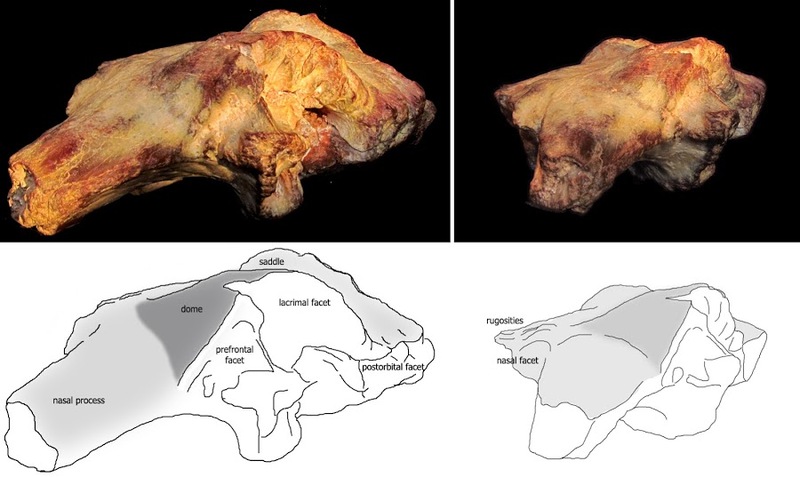 The frontals of Sauroniops and Carcharodontosaurus, both from the ‘Kem Kem compound assemblage’ of Morocco, show comparable size but differ in the extent of the naso–frontal articulation, the shape and disposition of the prefrontal and lacrimal articulations, the development of dorsal ornamentation and the morphology of the supratemporal fossa. Among carcharodontosaurids, the skull table developed unique configurations among each lineage and appears diagnostic at the species-level. The dome-like frontal in Sauroniops may indicate head-butting behaviour in this taxon or evolved for visual display. 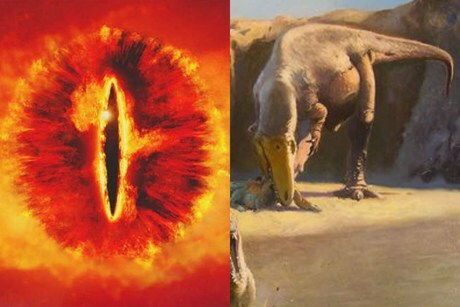 ► A new giant theropod dinosaur from the Cretaceous of Morocco is erected. ► It is referred to Carcharodontosauridae based on skull roof synapomorphies. 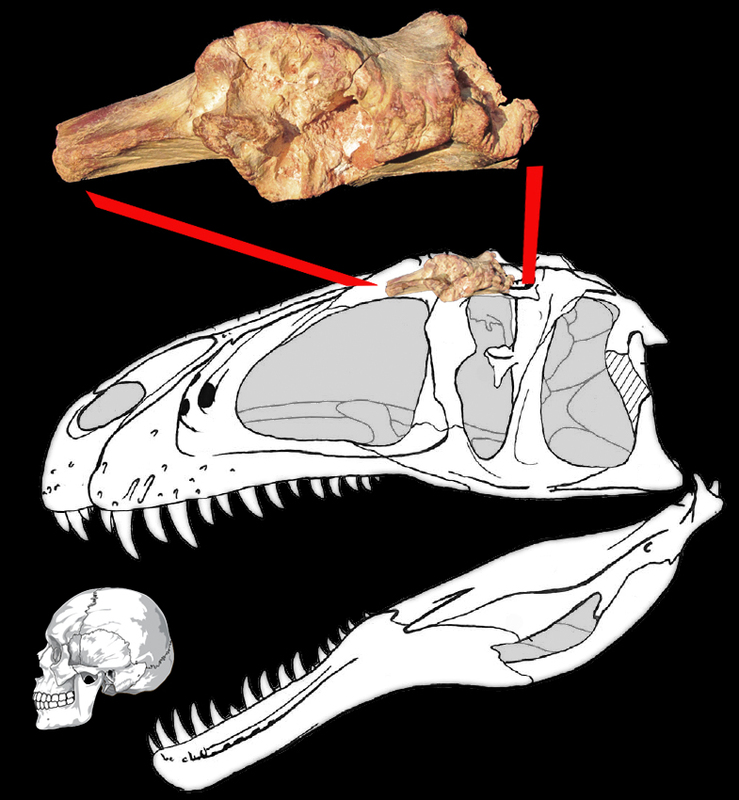 ► This theropod shows a frontal dome and ornamentation convergent with abelisaurids. ► Homoplasy and taxonomic values of carcharodontosaurid skull tables are discussed. We report an isolated frontal of a large−bodied theropod from the Cenomanian “Kem Kem beds” of Morocco with an unusual morphology that we refer to a new carcharodontosaurid distinct from the sympatric Carcharodontosaurus. The specimen shows an unique combination of plesiomorphic and potentially autapomorphic features: very thick and broad bone with a complex saddle−shaped dorsal surface, and a narrow vertical lamina between the prefrontal and lacrimal facets. This study supports the hypothesis that a fourth large theropod was present in the Cenomanian of Morocco together with Carcharodontosaurus, Deltadromeus, and Spinosaurus.